Members receive an additional $3.00 off at discount. This is is a beautiful book of meditations on Our Lady based on the Litany of the Blessed Virgin and on her Magnificat prayer. It also contains reflections for all the major feasts and solemnities of Mary, as well as poetry centered on the Mother of God. These meditations come from the profound prayer of a holy contemplative nun, which gives a unique unction to her reflections because they are inspired by the Holy Spirit. The great St. Bernard of Clairvaux said, “Of Mary there is never enough”, and in the spiritually and morally challenging times that we live, these powerful Marian meditations will give us the wisdom, love, hope and strength we need to pick up our daily crosses and win the battle of life. 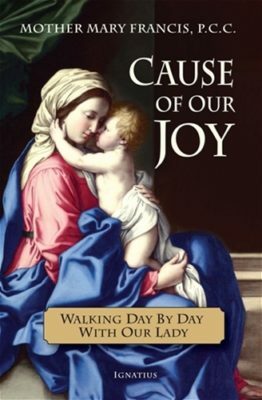 Acclaimed spiritual writer Mother Mary Francis speaks with an intimate familiarity of the Mother of God, and you will feel that same closeness to Mary after reading these soul stirring reflections. This book will be a vade mecum for all those who seek a deeper closeness with Jesus through his Mother. This Poor Clare abbess, gifted with a brilliant intellect and a poet’s heart, lived in abiding relationship with Our Lord and Our Lady during a monastic life spanning 63 years. In these pages you will discover the wondrous secret that walking with Our Lady day by day is the unending cause of our joy.